Ever feel like all your hard-earned cash is being eaten up by your family … literally? You try your hardest to keep your grocery bill down but feeding your brood’s insatiable appetite is an expensive operation. You know there must be a cheaper way but you’re just too busy to explore and experiment. The last thing you want is to spend precious free time holed up in the kitchen testing the latest gastronomic masterpiece. The good news is that creating cheaper meals quick is as simple as occasionally skipping meat. It doesn’t matter if you’ve never tried a meal without meat before. If you’re worried about your grocery bill, now is the time to try adding the occasional meatless recipe to your meal rotation. Let this guide be your new start. Why veggies can be more than a match for meat. Eating like a vegetarian every so often can save you time in the kitchen and cash on your grocery bill. Plus, there are enormous health benefits to cutting down on meat, including a lowered risk of heart disease, cancer, diabetes and obesity. Grains and legumes such as chickpeas and rice are an excellent alternative source of protein to expensive cuts of meat. They’re also extremely versatile, exceptionally cheap and can be bought in bulk to further reduce the price. You can save even more by stocking up on commonly used herbs and spices such as turmeric, cayenne pepper, cumin and curry powder when they’re on special. Even go a step further and grow your own herbs, which is much cheaper than buying fresh bunches and far less goes to waste. Now that you know what to do, it’s time to get cooking. To help you out, I’ve trawled my favorite meatless websites to come up with 52 vegetarian recipes that can be whipped up for under $10 each! Hearty meals for a hungry family. 1. Vegetarian pot pie – use up leftover vegetable odds and ends with this hugely flexible throw-everything-in meal. 2. Roast pumpkin and cannellini bean soup – give traditional pumpkin soup a filling protein punch by adding creamy white cannellini beans. 3. Black bean burgers – these basic ingredients are packed full of protein for a meat-free burger patty that cooks up quick. 4. Moroccan vegetables with chickpeas – throw everything into the oven and come back half an hour later for a satisfying low-calorie meal. 5. 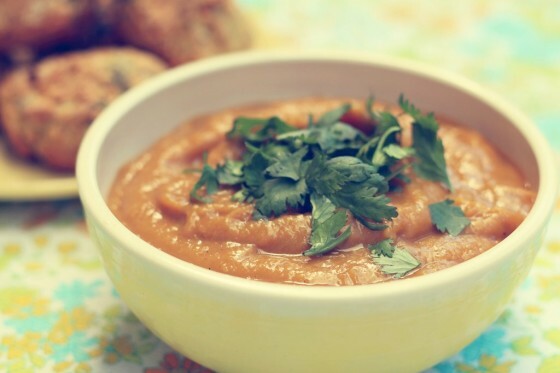 Indian lentil soup – turn lentils into something truly tasty with just a few spices and some cheap veggies such as potatoes and carrots. 6. Chickpea tagine with cinnamon, cumin and carrots – a good one to throw together and leave to simmer while you get the kids organised. 7. Pumpkin and potato bake – turn a simple bake into a meal by adding a protein-rich cup of lentils. 8. Spring vegetable minestrone with broken spaghetti – ideal for using up vegetables and half-used packets of pasta, this meal can also be frozen for later. 9. Chickpea and pumpkin Moroccan strudel – this strudel filling is a cinch to make and can even be served up as a curry if you’re out of frozen pastry. 10. One-pot mushroom and potato curry – a hearty, spicy dish that will be ready in under 30 minutes. Lighter dishes for easy eating. 11. Basil, tomato and mozzarella pizza – makes enough sauce to freeze for round two. 12. Homemade falafels – far cheaper than store-bought options but just as tasty. 13. Zucchini potato pancakes – the perfect way to use up a giant zucchini with healthy pancakes packed full of fresh goodness. 14. Cauliflower leek soup – a thick and creamy soup, without the need for cream. 15. Nettle pasta – a wonderfully green pasta using stinging nettles. Yes, stinging nettles! Spinach can also be used as a substitute. 16. Spinach, feta and sundried tomato strudel – all the nutritional benefits of spinach wrapped in a deliciously flaky pastry. 17. Potato and pea soup – the perfect winter comfort food, this recipe makes a big pot for sharing or to enjoy over several days. 18. Vegetarian taco salad – a healthy and colourful salad that can be partly made ahead for quicker assembly at mealtime. 19. Pumpkin and rice soup – make your pumpkin soup go further by serving it over rice. 20. Spinach and feta filo pies – an incredibly cheap recipe that looks a lot more expensive than it is. Super quick bites for time-poor moms. 21. Black bean zucchini quesadillas – expect to have dinner on the table within 15 minutes using this easy recipe. 22. Avocado scrambled eggs with onion and cheddar – take a breakfast-becomes-dinner approach for quick and nutritious results. 23. Red lentil soup with lemon – save time by using pre-cooked canned lentils in this deliciously lemony soup. 24. White bean and vegetable burgers – use frozen vegetables to get this meal on the table even quicker. 25. Spicy mushroom stir-fry – throw a few ingredients in a pan, stir for a moment and your meal is ready. 26. Easy veggie pasta – tired and don’t feel like cooking? This is the recipe for you. 27. Beans with tomatoes and Swiss chard – this quick and versatile meal can also be enjoyed cold as a salad or puréed into soup. 28. Sautéed chickpeas with broccoli and parmesan – just a few minutes over the stove and this protein-packed meal is ready to eat. 29. Spicy mushroom and broccoli noodles – mushrooms give a “meaty” texture to this quick stir-fry. 30. Mushroom and white bean soup – load up on mushrooms with this hearty but quick soup. Out-of-the-pantry meals for when the fridge is bare. 31. Tomato and onion Spanish rice – an easy “throw everything in and simmer” recipe. 32. Mung bean masala – harness the health benefits of mung beans and give your family a protein, vitamin and fiber boost. 33. Simple tomato soup – add a little zing to your soup with a few spices then serve over rice to make it stretch even further. 34. 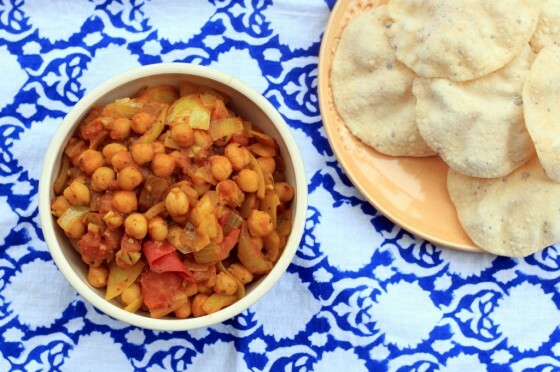 Quick and simple chickpea curry – just onion, chickpeas, canned tomatoes and some common spices you’ll almost certainly have in the pantry. 35. Healthy mac and cheese – this family favorite has a ton of flavor but far less cheese and milk for a healthier alternative. 36. Tomato and basil pasta – save time and money with this easy 15-minute meal. 37. Baked curried brown rice and lentil pilaf – pop everything in the oven and come back when it’s done. 38. Everything-from-the-pantry bean soup – a nutritious way to use up whatever dry beans you have lying around. 39. Garbanzo and tomato pasta soup – a quick and protein-rich soup that’s sure to fill up the family. 40. Tomato rice soup with roasted garlic and navy beans – this recipe calls for roasted garlic but save time by sautéing instead. Bargain basement bites for a truly frugal feed. 41. Mushroom sub sandwich with chunky fresh salsa – this chucky-licious super sandwich can be made for as little as $1.95 per serving. 42. Simple whole-wheat roll – make a gourmet-style meal with little more than carrots, onions, beans and flour. 43. Quick and easy vegan dhal – a basic dhal that can be further simplified to just three main ingredients in tough times. 44. Super-cheap pea and pearl barley risotto – traditional rice is substituted for far-cheaper pearl barley in this easy recipe. 45. Cauliflower and broccoli soup – only four ingredients are needed to whip up this hearty soup. 46. Bean and zucchini cutlets – chunky patties simply based around canned beans and zucchini. 47. Savory bread pudding with spinach and mushrooms – turn a traditional sweet into a comforting savory meal that’s perfect for using up stale bread and vegetable odds and ends. 48. Potato curry – a filling curry based around two very cheap ingredients: potatoes and onions. 49. Eggplant and potatoes in tomato sauce – a simple but satisfying meal that’s especially perfect if you have leftover boiled potatoes lying around. 50. Vegetable Chowder — an amazingly satisfying meal whenever you’re ready to clean out your vegetable drawer. 51. Squash and coconut curry – a 5-ingredient curry that can also be served over rice to stretch further. And finally, my secret ingredient for transforming even the simplest of meals. 52. Magic sauce – beautiful fresh herbs and a dash of lemon and garlic combine in this versatile homemade gem that can be splashed over everything from scrambled eggs and salads to soups and baked potatoes. It can even help turn a bowl of soba noodles into a meal if you’re desperate. It’ll keep well in the fridge so you can always have a batch on hand. Guess what? You now have enough quick and affordable recipes to make one meatless meal every week for an entire year. So no more excuses. Put away the meat for one night a week and watch your savings grow! 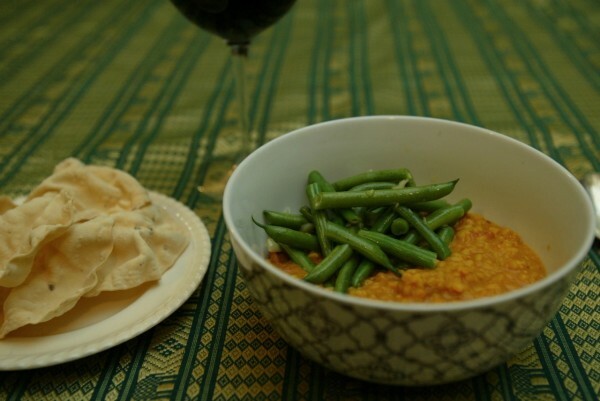 Koren is an Australian who likes to eat well without spending the earth. She and her sister, Alana, create simple and cheap vegetarian recipes for everyday people at She Makes Magic, plus offers tips on how to live a kind and ethical lifestyle. « New printable coupons: Jennie-O, Folgers, Burt’s Bees, Revlon, Pantene, Ajax, plus more! I’m a vegetarian, and I really struggle with getting in a food rut. I scanned your list and was suddenly reminded that there’s more to life than burritos! LOL. Thanks! I’m a vegetarian and this is a great list! Thanks for sharing! Thank you for this beautiful list! I really want to incorporate more vegetarian / vegan friendly meals into my life but all the books from the library include items I would never eat. This list is so exciting – I saw multiple recipes which look YUMMY! This post is a fantastic treasure! Thank you! Thank you! Thank you! This is a gold mine for vegans (like me) and anyone who wants inspiration for wholesome, fantastic food! Did I say “Thank you!” ??? Being a vegetarian I always love new recipe ideas! thanks! One a week for an entire year? Forget that. I’m forwarding this list to my husband to see about making 3 or 4 a week until they run out! We love frugal vegetarian meals that also have protein; they’re a big part of how our little family remains solvent. Thank you for sharing such a diverse and incredible list! I’m looking forward to trying so, so many of these. These recipes look good so thank you. However, I am never impressed with ‘$10’ meals as a way to spend less. We eat meat at almost every meal and never spend $10. Of course we don’t eat organic. We just buy meat on sale and eat reasonable portions. The guest post for this post lives in Australia, where food costs are much higher. I see magazines that have those kinds of suggestions all the time and they drive me nuts, too! I get all excited about meals that cost $1.25 to find out that it’s $1.25 a serving, not $1.25 for the entire meal. My own family usually eats dinner for $1.25 for the family, so I know it can be done. Going meatless is a huge part of that. Thanks for this wonderful list. 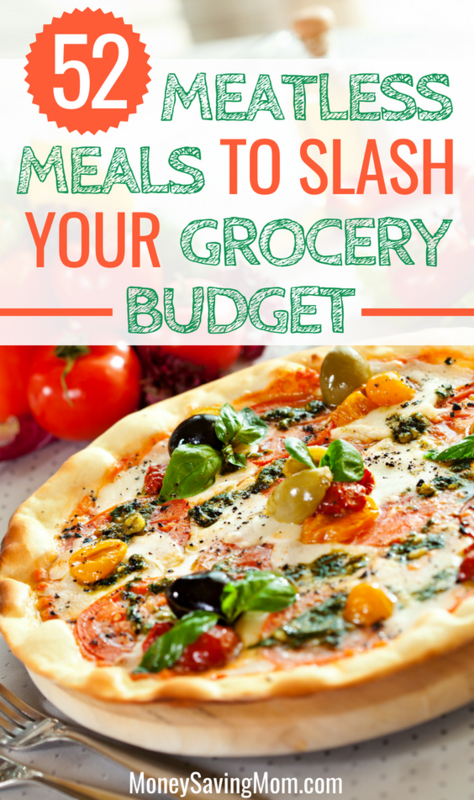 It’s true that meatless meals can be a huge money saver! We are slashing our grocery budget by a third in order to speed up debt pay-off. Being vegetarians it’s been hard to find new budget recipes. This post is PERFECT timing! I’m so excited to try these! Thank you. I truly love this list. We do one meatless meal a week, but I am not that creative. (need to get out of the cheese ravioli rut). We generally plan 2 chicken dishes, 2 beef/pork, 1 meatless, 1 budget(any), and 1 leftover. This makes my weekly menu planning super easy, with plenty of variety. I know what you mean. I mentioned doing a meatless meal 1-2 times a week and my husband did not take to the idea. I’m still going to try it, though. I’m cutting out a lot of meat for health reasons rather than cost though. Thank you for the link to my black bean burger recipe! My readers love it! You may want to make some homemade steak sauce to go with it (also on my site). We make quite a few meatless meals. My goal is to feed my family of 9 three meals and a snack for $3 a day for all of us. It’s a lot of work, but it’s what we have had, so I make it work. That is simply impressive! Kudos to you! This is an awesome list and loaded with great ideas and recipes. I am bookmarking this for sure and will be sharing some on my website! Thank you SO MUCH for sharing this. Just what I needed right now. And I discovered some great looking blogs by clicking on some of these tasty sounding recipes. THANK YOU! What about egg dishes? Quiche, Frittata, Egg Sandwiches, & Egg Burritos make great meatless meals. The government shutdown hit us today. This will be a great help! Nobody in my house except me would even take a bite of any of these. My DH will eat white potatoes, corn, green beans, or peas. My DS will only eat broccoli, but he likes fruit. He won’t eat potatoes. My older DD will eat green beans, snap peas, corn, and broccoli (no potatoes either) and no fruit. So far, the baby will eat some of both but has also done a lot of rejects, but I keep trying! As for me, I will try it so long as there’s no mayonnaise, cabbage, or tapioca in it. This summer I tried new veggies including rhubarb (had it as a kid and didn’t like it then, still don’t like it) and kale (did not like it). But I wanted to set a good example and try. In our house, grilled cheese is the go-to frugal, fast, and meatless meal. Of course, you can put meat in it if you want to, but my kids prefer it without. You can add some thinly sliced peppers, onions or tomato (or not, if you’re my kids or DH)! How did you cook the rhubarb? Rhubarb does very well for most people when cooked with sweeter fruit – say raspberries or strawberries and a lot of sugar. We like it with less sugar than most people but it is a very bitter veg! Yay to you for trying! I made a fruit crumble along with canned peaches. Check out the book French Kids Eat Everything. Your family can eat healthy meals and not be so picky! I don’t think that you had this recipe, but maybe I just missed it. I like this better than the actual meat version and it is delicious on a plate of nachos as well. Super budget friendly and with the exception of onion and garlic (and toppings), everything else is a pantry staple. So excited to look at this more. I already eat vegetarian, but new recipes are always welcome (especially for the 25 pounds of chickpeas I just bought). You mention stocking up on spices or growing your own. Both great options , but I wanted to add another. I’ve have been going to my local natural health store for spices, the difference in price compared to the supermarket astounds me. Thanks for the list, I’m always looking for new vegetarian recipes to try. Yes! This is such a great tip. If you keep the little jars from the store-bought herbs and spices you can then buy in bulk and just refill them. Much cheaper. Good one, Stacy. Also if you have an Indian or Asian grocery store the prices for spices, pulses and rice are super cheap (plus a lot of them are organic). You can get bags for a few dollars which is the same as buying the little jars at the store. We don’t have any local health food stores around here only Whole Foods and Fresh Market which are far more expensive. Everytime I see a post about mealess meals I’m intrigued. I am not a vegetarian nor do we eat meat at every meal. However, here is my problem/question. Except for chili beans I can’t stand beans. I have tried and they nearly make me gag. My husband, who isn’t picky, also is not a fan of beans. Anyone who switched over to mealess was there a way to get over not liking beans? There are meatless meals that don’t include beans! Think about a simple pasta with sauce or a different meatless topping, a salad with hard boiled eggs alongside tomato basil soup and homemade French bread. There are lots of kinds of beans, and many ways to season them. Perhaps you just haven’t had something you’ve liked yet. I agree with Prudent Homemaker’s excellent advice. There’s sooooo many beans out there of all different shapes, sizes, textures, colours and tastes. Maybe it’s time to experiment a little more widely to see if there’s something you like? The other option is to kind of hide them in your food. So maybe make a pumpkin soup and blend some white beans up with it. You probably won’t even taste them but you’ll still be getting that all-important protein punch. Just FYI: The last paragraph should be Guess, not Guest. Grace. I’ll be honest, I’m not huge on caulifower, but I can’t get enough in this dish. It soaks up the spices and you can’t even tell you’re eating cauliflower! This is perfect timing, We just started (10/1) an adventure to eat for $3 per person, per day, with a goal of doing it with whole, real foods. This list is great for me. I started a blog, to go along with the adventure, but I am a super-new blogger, so it’s a little rough right now. I’m not much of an meat eater so it’s always nice to find vegetarian recipe collections like this. Can’t wait to try “Everything from the Pantry Bean Soup”! Thanks for sharing! As much as I would like to try some meatless meals, our family loves their filling home cooked meals. Like mashed potatoes (no gravy) or rice, meat of some sort, vegetables, and salad. We love our salads. I do make homemade pizza, have a potatoe bar, etc. some nights. I am not sure if too many of these recipes would be liked. But I am gonna give some a try. 🙂 No one likes curry or cumin. Especially, not beans. I do a lot of canning so we do cut costs that way. I can green beans, some meat, spaghetti sauce, pizza sauce, pickles, V8 juice, grape juice, apple pie filling, freeze corn and green beans, strawberries, blueberries, peaches, jam, applesauce, and sauerkraut. Probably missed something there. 🙂 Freezing and canning is a great way to save. Its really easy to learn how to do it if you didnt grow up doing it like I did. Thank you for your great list of meal ideas! ☺ I am going to share this on Pinterest. Not an option. Meat is a must for my family! This is great, unless you live in the Midwest where produce is shipped in from other parts of the country for most of the year, and meat is a lot more accessible for a lot less money. I wish this was a pdf that could be printed out all at once. Wow! I am looking for something that can be handed to low income folk looking for new healthier vegetarian recipes but many do not have access to the web.